come visit the new blog! 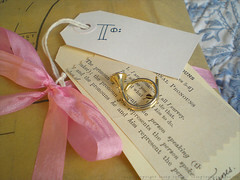 Please Note: this is the last post I will be publishing at this address (https://elegantmusings.wordpress.com). Please adjust your feed subscriptions and bookmarks to point to the new blog. Thank you!! My printer has been humming away lately. I’ve been doing loads of research into various areas of graphic design lately. I’m not one of those people who likes reading long articles on my computer (perhaps it’s because I do spend so much time staring at the screen!). Now I have a stack of papers next to my desk. Scribbled and highlighted. Reminds me of prepping for a research paper! 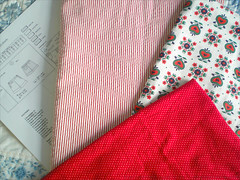 I also printed off something much less… wordy: the Ruby shorts from Burda Style! Confession time: I hate wearing shorts, but they are a nessecity in the hot and humid Virginia summertime. Last pair of pants I tried creating totally crashed and burned too… So this is Casey Going Out on a Limb! But I bought a red, stripy (yay! I know, I’m obsessed with stripes–and red.) material at JoAnn’s the other day. I think I’ll use a fun vintage print for the facing and turn it to the outside so they’re a little more interesting than the usual shorts-fare. But we’ll see how this goes… Not sure when I think I’m going to have time to sew these; life has just been far too hectic lately! lol. a cute idea for really saving your pennies! the perfect “flea marketing 101” guide! this space is inspiring me with it’s vintage whimsy! What are your plans for this weekend? I hope you’re doing something fun, and relaxing! I’ve got a packed weekend… all kinds of fun and games, and little plans here and there for all sorts of excitement! Happy May Day, my dears! Hurrah for May! I love May more than any other springtime month… and it’s not just because my birthday is nestled in. hehe. The weather and general excitement over the springishness is causing me to contemplate season-appropriate accessories. Rhiannon posted this beautiful photo a month ago. It’s been stuck in my mind ever since! I used to wear flowers in my hair occasionally, but during the wintertime I generally don’t–mostly because I think I’d look rather ridiculous traipsing through snow with a flower stuck in my hair! lol. The other day I was in Michael’s during a routine “eraser-run” for my always-sketching sister, and spotted their single-stem florals were 50% off. So of course, having spotted some pretty silk flowers a few weeks ago (and not wanting to pay full price), I snatched up a few picks; two “gigantic” and a stem of small, red flowers. I snapped the heads off (eek! lol), was happy to discover that they actually glue together the layers of silk flowers now (so they don’t pop apart like they used to when you pulled the wire stems out), and trimmed down the plastic connectors. I glued them all to clip-style barrettes (tip: open the barrettes before you glue the flowers on), and used hot glue to attach the flower heads to the barrettes. I know some people use oversized bobby pins instead of barrettes, but I’ve always had a hard time with those sliding out of my hair over time. 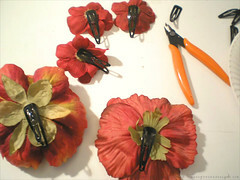 For under $5, I have five floral barrettes to embellish my hair-do’s! 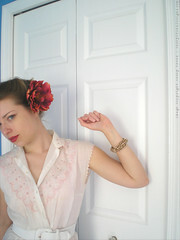 I am definitely dying to wear the large flowers soon–they’re so dramatic! I think, however, I do need to make some in other than pink or red–I have a tendency to get “stuck” on just those hues when it comes to selecting flowers! hehe! Congrats!!! I think these little drawings are way too much fun; perhaps I’ll have another later this month. So keep your eyes peeled! Have a lovely Thursday… I shall be back tomorrow with my weekly round up of links and other inspiration; and perhaps some reporting on the craft/creativity front! Honestly, I haven’t been staring at my computer, working on my side redesign exclusively for the past week! lol. Saturday ended up being my self-imposed Computer Break (because I had been fiddling with the site layout too much. I must learn self-control in the area of tweaking little code snippets!). Instead I set to tackle the *dundundun-dun* Mess. The upside of my compulsive antiquing/thrifting/yard saling/bargain-hunting is that I find some really amazing treasures that have proven to be very useful. It has fostered a greater resolve to not spend so much money, and recycle/reuse. The bad is that it gets to a point where the stuff starts taking over my room (and eventually my little corner half of the basement). Clutter depresses me. It chokes my urge to sew, create, or generally have anything to do with my room besides work on my computer, exercise, and sleep. I took everything out of my closet, sorted, re-boxed, threw-out and bundled up to give away and sell. I went through all my papers and put aside large stacks of vintage ephemera to package (for the popular Vintage Paper Packets I sold out of last autumn!). Even my bed was pulled out, vacuumed under (the dust bunny population was not happy…). Now I just have to go through my fabric and clothing that is stored in the basement. That scares me! Not because there is so much (though there is…), but I tend towards keeping rather than getting rid of when it comes to old clothing. But what if I need it, you know, later?! is what the excuse is to resist the decluttering. 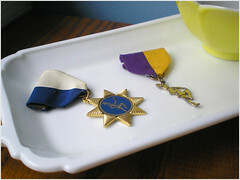 * I must confess, this is in rather sad condition (it came to me that way), but I couldn’t bear to just toss it. 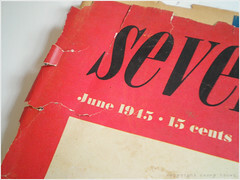 I think it would prove useful for collage–or even tearing out the pages and framing them! Comment in this post between now and Wednesday evening, and I’ll randomly draw a name on Thursday. Be sure to comment with your email (it won’t be published) so I can contact you if you win! 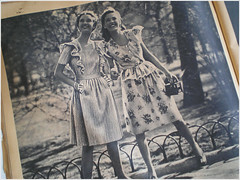 This week we’re going back into the 19th century with Vintage Monday! 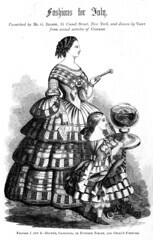 I love this illustration from the mid 1850’s; I mean look at the skirt’s flounces!! I sercretly harbor a desire to have a three-flounce skirt, only probably at a more manageable length (I am nicknamed “Casey the Klutz” for a reason…). And look closely: the flounces have stripes. Which is even better, in my opinion! 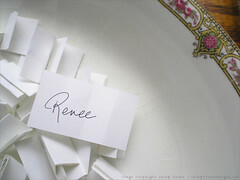 Thank you all again for your sweet comments about the portfolio site and blog–you all are such dears! After days of furious coding, databases crashing (not my fault…), late nights, and trying not to change the design yet again, I have a portfolio website! I’m so ecstatic! 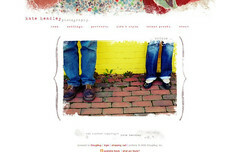 In the process I also moved my blog, and the new address is: http://blog.caseybrowndesigns.com. As with my last blog-move, I’ll be posting in conjunction with the “old” blog for a week, and then will permanently move to the new home. So please adjust your feeds (sorry about this–I know it’s so annoying!). So what do you think? I’ve been attempting to move away from my Elegant Musings moniker for awhile; it’s been an online identity I’ve had since my late teens and doesn’t quite fit anymore. Its a huge leap of faith for me–I’m really nervous people will view my blog/work differently (in a less friendly/approachable way; does that make sense?). But after talking with Kate a few weeks back about establishing an professional presence online, I know that this is the right move. Especially as I’ve been getting more work in the graphic design field and realizing that I really needed a portfolio! There will be a few changes to the site and blog. Elegant Musings will still be maintained as a place to house my favorite inspiration images. I love sharing those with y’all! The site will probably be restructured later this year to reflect the changes, but will remain at it’s current address. Here’s a preview of some of the exciting stuff I’m working on for the new portfolio and revamped blog! – The blog will be restructured a tiny bit. I still plan on writing about my sewing and other projects, but I also really want to bring in topics like art and design; two things that are near and dear to my heart, yet I have rarely talked about online. I think I feel somewhat shy about thrusting them on my blog readers, since my blogging to this point has been so creativity-centric. Well, I guess it’ll still stay creative–just an expanded definition! – I’ll also occasionally write about my latest projects/commissions. I realized after I posted Kate’s site that most of you had no idea I do this! hehe. I guess it’s because I have been kind of silent on that aspect, mostly because the freelance work didn’t start coming my way until January. So it’s all still new to me! – There will be more freebies to download over the course of the summer. I have a lot of desktop backgrounds and other miscellaneous images/resources I’ve created over the years that I’m dying to share with y’all! I want to thank everyone who has encouraged me (directly or not) during this process! Especially Kate for encouraging me to take the leap into my new identity, and Nubby Twiglet’s sage advice again and again about creating an effective website. And thank you all for following me around the last year as I’ve transitioned and been seeking to find my place in life. It really means a lot to me to have such a wonderful support system. You all are so sweet! I’ve been struck by the urge to go through all my stacks and stashes of stuff and dispose of items that I no longer need. I suppose it’s only fitting, considering that it is springtime, and spring cleaning is in order. Most of the items I’m giving away/selling/otherwise dispossessing were collected during my teenage years. Perhaps it has to do with my birthday two weeks away. I had a very lovely–albeit far too short–weekend with my Beau. He was only up for two days; we had so much catching up to do, things to discuss, places to go… But we did get to just sit on the deck Saturday evening as the sun went down and enjoy the beautiful weather. I have been listening to the Lost in Translation soundtrack and various Jesus and Mary Chain albums almost constantly since yesterday morning. A rainy gloom has settled over the sky, but its different from the cold gloom of the winter; I think the warmth of the air makes it more bearable–almost fun. I walked around outside yesterday with an umbrella held over my head, my toes splashing in the warm rainwater as it cascaded down the street. I love springtime! 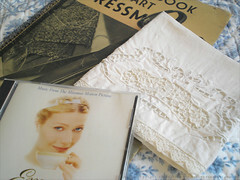 Last week I found a new-to-me antique shop in one of my favorite, small towns nearby. Although it was generally overpriced, there were a few deals here and there–one just had to do some digging! 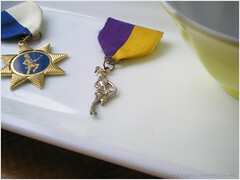 I unearthed these two, darling drum majorette pins (I’m especially fond of the silhouette one), and a 1945 copy of Seventeen. Its kinda falling apart, but I love all the illustrations and fashion and oh! 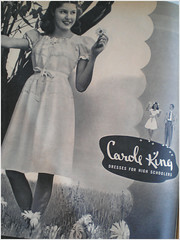 I’m just as in love with the 1940’s as ever. lol. 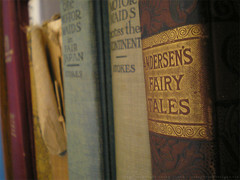 So in place of my usual, Vintage Monday feature, here is an array of images from this lovely find; hope you’re inspired. p.s. 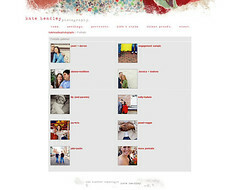 Oh, and I just wanted to say that I really appreciate the feedback about the site design I did for Kate! *blushes* Yes, I do a little bit of graphic work and website development on the side, I just rarely tend to talk about it here! Just popping up from my little hiding-spot behind my computer screen! I’ve spent a good deal of the week immersed in coding and design… In fact, I think I’ve become a wee bit obsessive lately–formatting and editing code until the wee hours. hehe! Anyway, I just finished working on a website for the lovely Kate! Her photography is really gorgeous–I just love the lush colors and the way she captures the scene. I was so tickled that she asked me to do this for her–go check out her beautiful work! Anyway, I’m keeping this rather short because the Beau is visiting for a super-short weekend! I haven’t seen him in nearly a month, though it seems quite longer. We’re trying to cram all kinds of things in the couple of days he’s back: errands, catching up on ‘news’ and other important-things, celebrating his birthday… Problem is I’ve only got one half of his birthday gift. I purchased an amazing tshirt from Poison Apple Shirts, but the dive knife I wanted to get him isn’t in the local shop anymore. Oh well… I’m sure i can always find something. Enjoy this week’s links. I hope you all have a absolutely fantastic weekend!! 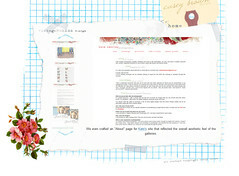 ♥ tutorial of recycling magazine pages into bubble mailers! 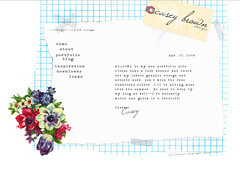 ♥ nubby kindly answered my font question with some fantastic resources! p.s. Did you know Wendy’s new book is out??? I don’t know about you, but I’m saving up my pennies for this one!